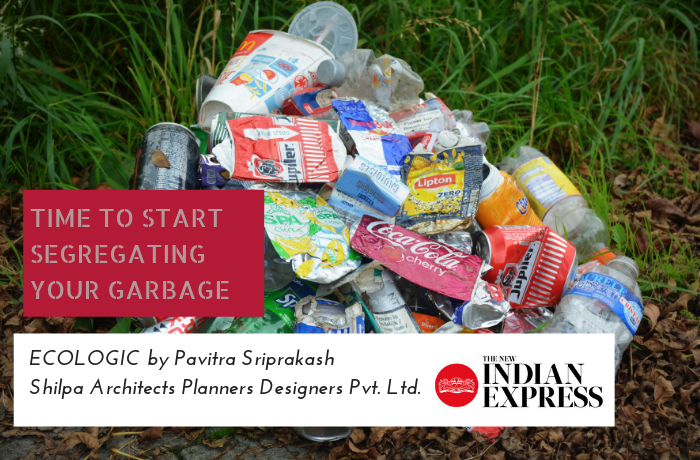 29-Dec-2018: Pavitra Sriprakash, Director and Chief Designer at Shilpa Architects Planners Designers writes a weekly column on Sustainability for The New Indian Express titled “ECOLOGIC”. This week she writes about green resolutions for 2019. It’s the time of the year we all make promises to ourselves — to lose weight, be healthy or simply just to live better. The writing is pretty much on the wall that the earth is unhappy with us. The climate is downright scary and there are things happening that bring normal life as we know it to a screeching halt. Let us make some resolutions this year that are good for the environment. Every one of our ‘small’ changes make a huge impact and remember even a minor lifestyle alteration — even if that is only adopted by a mere 10% of the population — would create a revolution and make a huge difference for our health and the well being of this fragile planet we love. With the plastic ban stepping into force in Tamil Nadu come January, we will all be forced to alter our behaviour around plastics — especially single use, disposable ones. But, there will still be plenty of plastic floating around, thanks to plastic packaging which has become an integral part of our lives. Consider this a good resolution — stop littering and segregate your garbage. Think twice before you even buy a packaged good with difficult to recycle plastic, look for alternates wherever possible and pick for the environment as well as your health. Be the one asking for the banana leaf instead of the metal foil, pick the option that goes in a compost pit rather than the garbage bin whenever possible. Carry your own water bottle. The statistics on the number of plastic water bottles produced worldwide are staggering. We could fuel 10,00,000 cars with the oil used to produce water bottles in the US alone! If you’re still buying bottled water, stop, take a trip to your local store and check out the many great reusable water bottles on the market. Always order filtered water where possible or carry your own water. Get into the habit of treating your reusable water bottle like your keys or your wallet ensuring it goes to work, school, and everywhere with you. Eat well, organic and vegetarian as far as possible. Organic costs a bit more up front, but this is money well spent because your food will be more nutritious and you won’t have to worry about the health effects of eating GMOs, toxic pesticides, or contaminated water. Plus you can be sure that your food was grown in a way that helped protect and enhance the ecosystem it was grown in. Also locally grown food supports your local economy so that ensures food safety and livelihoods. The highly industrialised way in which most livestock is raised is inhumane, unhealthy and unsustainable making the case for vegetarianism very strong! Detox your home. Everything from dermatitis to headaches to cancer has been associated with the chemical products we use to clean our furniture, bathrooms and clothes — including air fresheners. Traditional cleaning agents assail our skin and lungs with carcinogens, assault our immune system, and expose us to unnecessary physical stress. They are also typically made from petroleum, and remain toxic in the earth’s soil, water, and environment for generations. In contrast, green cleaning products are typically made with common kitchen ingredients like water, white vinegar and baking soda. Think of your resolution as the start of an environmental revolution — every change counts. Happy New Year.